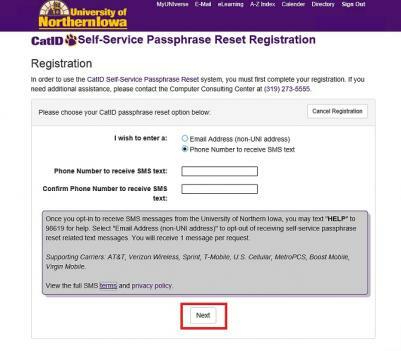 The CatID Account Recovery Tool allows you to register alternate contact information, either a non-UNI email address or a cell phone number, in order to allow you to reset your CatID passphrase sometime in the future should you forget it. Follow the instructions below to set up your recovery capabilities. Step 1: Log into MyUNIverse. Once logged in, look in the upper-right-hand corner for the pagelet titled My Account. There you'll see a link titled CatID Account Recovery Setup. Click that. Step 2: If you've not yet registered to use the new Account Recovery Tool, then you'll be presented with a screen asking you to register. 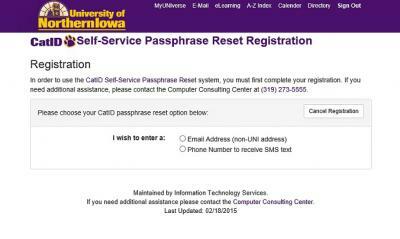 Click the large button that says Register for Self-Service Passphrase Reset. 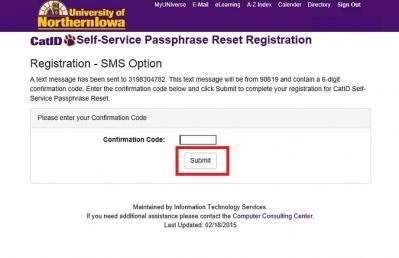 Step 3: On the next screen, select whether you want to register your cell phone number or alternate (non-UNI) email address. Click Next. Step 4: The following screen will show you a place to enter your cell phone number or email address depending on your choice in the step above. Make sure to type either choice accurately twice. Click Next to continue. Step 5: You will then be sent a security code as a text message to your cell phone, or as an email to your alternate email address. The next screen is waiting for you to enter this code. Once you receive the code, type it in, and press Submit. 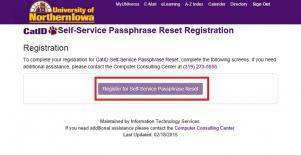 Step 6: You will be taken to a page confirming your registration. 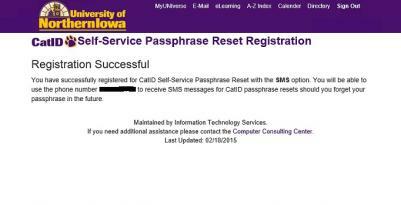 You have now completed the registration process for the new CatID Account Recovery Tool. 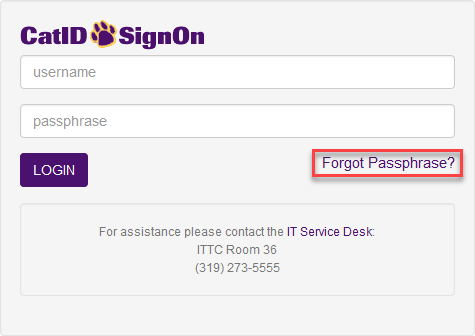 If you need to recover your password, visit the CatID sign in page and click on the Forgot Password? link which will take you to the CatID Account Recovery Tool.